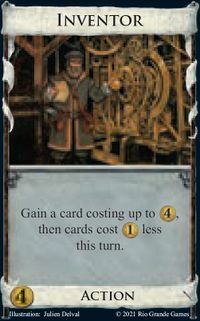 The default time in Dominion at which a card has an effect is when it is played. 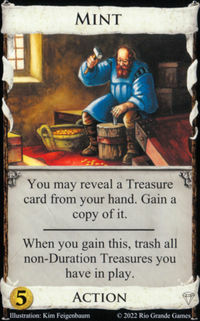 If an Action or Treasure card's text doesn't state specifically when the instructions on it are to be carried out, it is when the card is played. 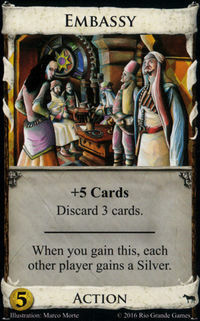 Since cards are played one at a time in Dominion (even Treasure cards), there is never any ambiguity about what order to resolve these effects in: play one card, resolving its effects; then play the next card, resolving its effects. Similarly, Events by default are resolved when you buy them. 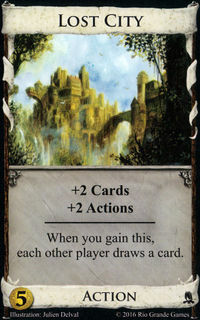 Many cards, however, and several Events and Landmarks, have effects at specifically-stated other times. 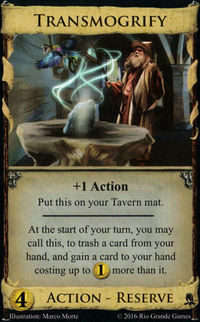 This page is an index of the various situations that can cause a card's abilities to be triggered. 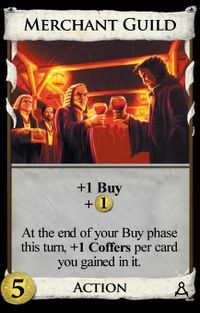 This can be interpreted as data for a flow chart: For example, if you are buying a card, look at the list of "when you buy a card" triggers to see if any of those effects apply, and if they do, execute them; then you can see if any of the effects triggered by buying a card themselves trigger other effects, and so on. 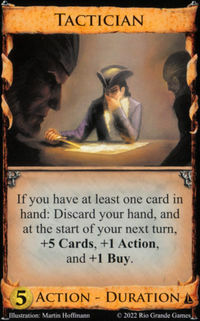 It is often the case that a single trigger can activate multiple cards' abilities simultaneously, and then the abilities must be resolved one at a time using the rules below. 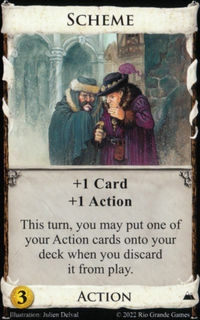 Some effects that take place at times other than when a card is played are thought of as being "set up" by playing a card; even though the effect itself takes place later, the act of playing the card is what causes it to happen. 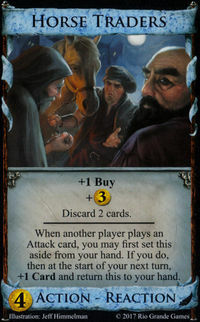 For example, playing the same card twice will cause the later effect to take place twice, and moving the card out of play will not prevent the set-up effect from taking place. Similarly, some Events "set up" effects for later when bought. Such effects are in general not listed here. 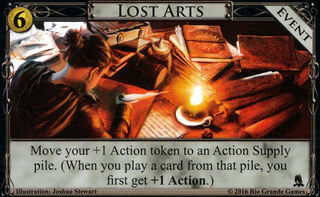 Other effects are caused by a card being in a particular location, such as the play area, regardless of how or why it got there. 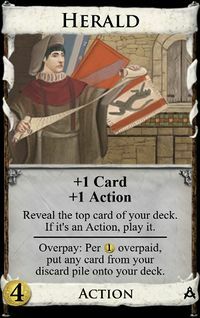 Cards in italics have been removed. 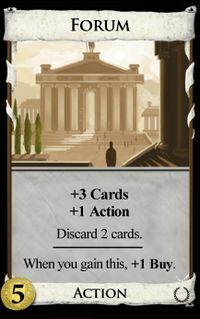 If multiple cards resolve at the same time on your turn (for example, Duration cards that do something “at the start of your next turn”), you choose what order to resolve them. 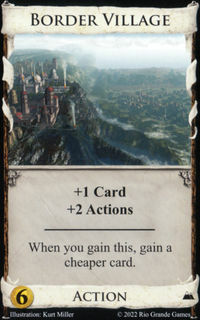 A card that affects multiple players during your turn still resolves in player order, affecting you first if it affects all players and then proceeding clockwise. 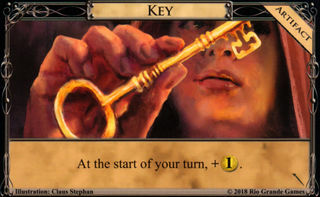 If an effect causes you to gain or draw multiple cards, you always in principle gain or draw them one at a time, resolving any on-gain or on-draw abilities of one before moving on to the next. 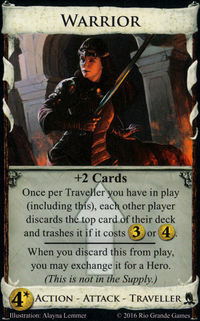 However, if you are instructed to trash or discard multiple cards, unless that effect is explicitly sequential, they are trashed or discarded at the same time. 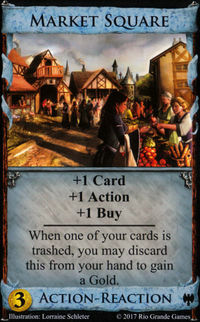 For example, Steward can trash 2 cards; if you choose that option, you may not trash one card, resolve an on-trash effect (such as Market Square 's), then trash the other card. 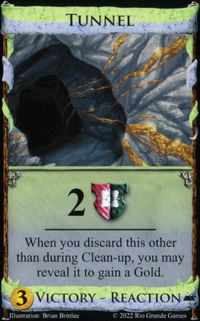 Both cards must be trashed simultaneously, and on-trash effects resolved with afterwards. 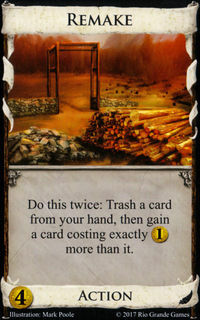 Conversely, Remake trashes two cards, but it instructs you specifically to trash them one at a time. 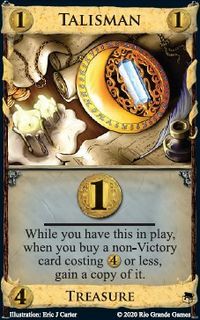 At the end of the game, your discard pile, your hand, cards you have in play, cards you've set aside, and cards you've put on mats all count as part of your deck. 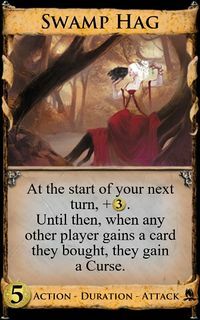 These are abilities that are executed at a single point in time: you fully resolve the card's ability by following the instructions on the card in order, and then move on to the next ability to be resolved. 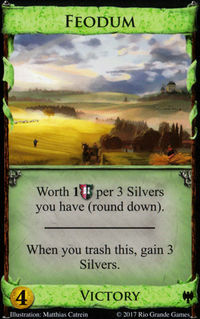 Trade Route : Put a token on each Victory card Supply pile. 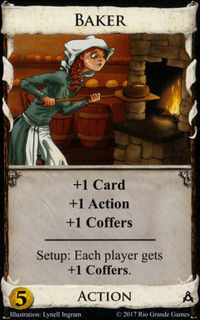 Young Witch : Add an extra Kingdom card pile costing or to the Supply. 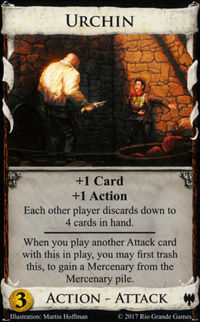 Cards from that pile are Bane cards. 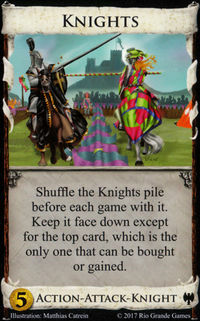 Knights : Shuffle the Knights pile. Baker : Each player gets +1 Coffers. Tax : Add to each Supply pile. Aqueduct : Put 8 on the Silver and Gold piles. 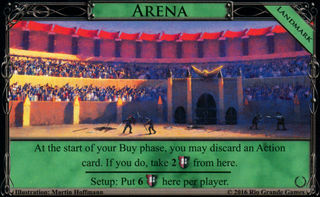 Arena : Put 6 here per player. 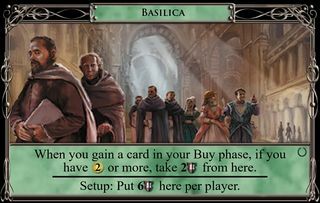 Basilica : Put 6 here per player. Baths : Put 6 here per player. 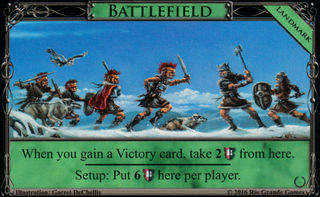 Battlefield : Put 6 here per player. 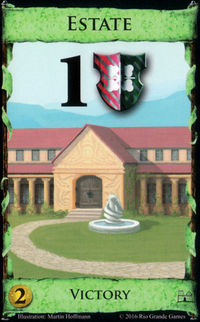 Colonnade : Put 6 here per player. 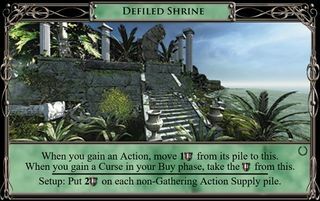 Defiled Shrine : Put 2 on each non-Gathering Action Supply pile. 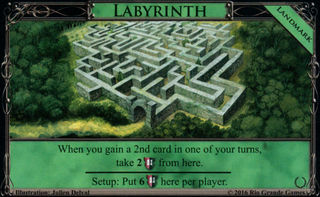 Labyrinth : Put 6 here per player. 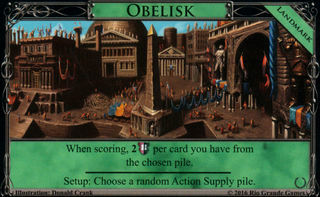 Obelisk : Choose a random Action Supply pile. 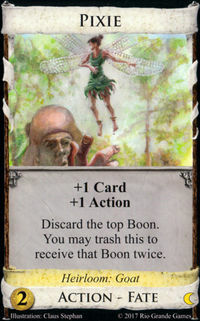 Druid : Set aside the top 3 Boons face up. 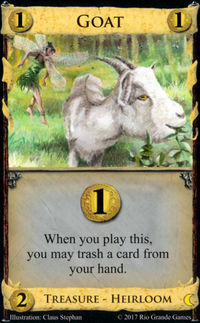 Pixie : Replace one of your starting Coppers with a Goat . 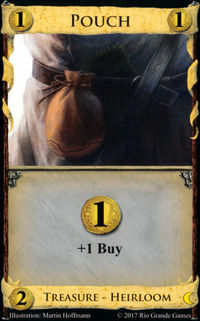 Tracker : Replace one of your starting Coppers with a Pouch . 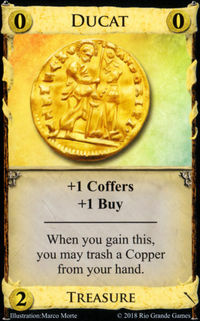 Fool : Replace one of your starting Coppers with a Lucky Coin . 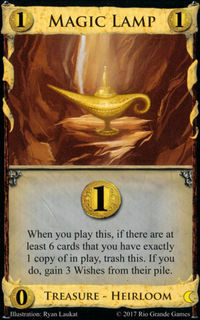 Secret Cave : Replace one of your starting Coppers with a Magic Lamp . Cemetery : Replace one of your starting Coppers with a Haunted Mirror . 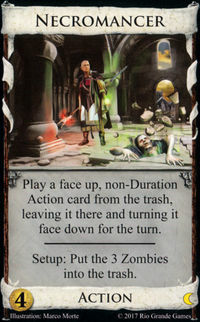 Necromancer : Put the 3 Zombies into the trash. 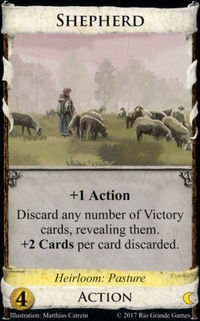 Shepherd : Replace one of your starting Coppers with a Pasture . 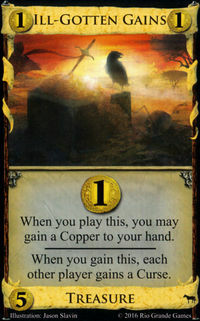 Pooka : Replace one of your starting Coppers with a Cursed Gold . 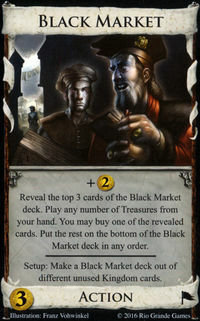 Black Market : Make a Black Market deck out of one copy of each Kingdom card not in the Supply. These do not happen in any particular order, and should all be completely resolved before the first turn begins. 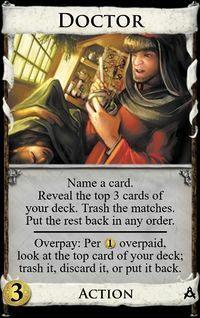 For example, if the Bane for Young Witch is the Black Market, then you must prepare a Black Market deck; conversely if Young Witch is in the Black Market, you must add a Bane pile. 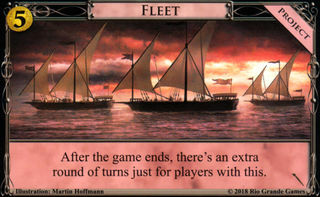 Fleet : Take an extra turn. 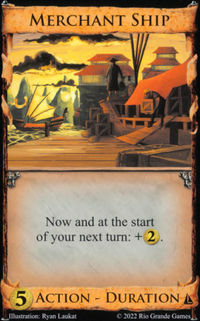 Haven : Put the set-aside card into your hand. 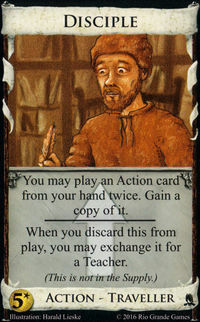 Tactician : If you discarded any cards, +5 Cards, +1 Buy, +1 Action. 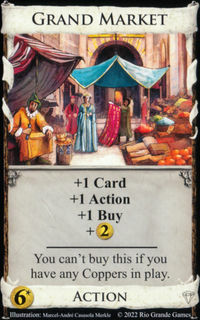 Horse Traders : If you set this aside, +1 Card and return this to your hand. 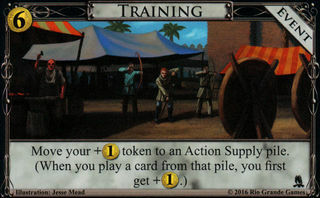 Teacher : You may call this, to move your +1 Card, +1 Action, +1 Buy, or + token to an Action Supply pile you have no token on. 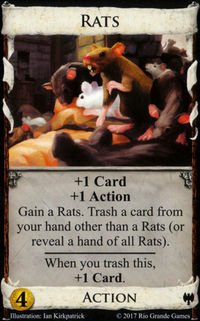 Ratcatcher : You may call this, to trash a card from your hand. 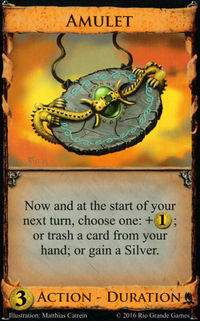 Amulet : Choose one: + ; or trash a card from your hand; or gain a Silver . 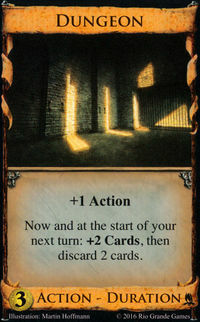 Dungeon : +2 Cards, then discard 2 cards. 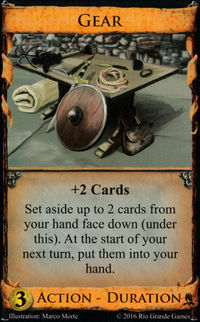 Gear : Put the set aside cards into your hand. Guide : You may call this, to discard your hand and draw 5 cards. 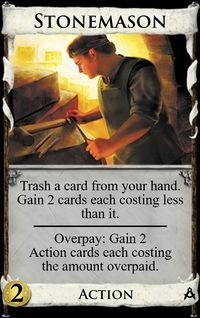 Transmogrify : You may call this, to trash a card from your hand, gain a card costing up to more than it, and put that card into your hand. 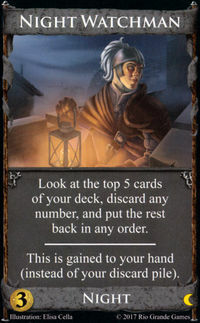 Archive : Put one of the set aside cards into your hand. 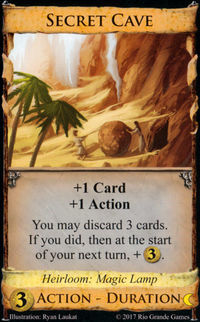 Secret Cave : If you discarded 3 cards, + . Ghost : Play the set aside card twice. 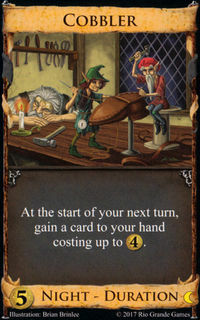 Cobbler : Gain a card to your hand costing up to . 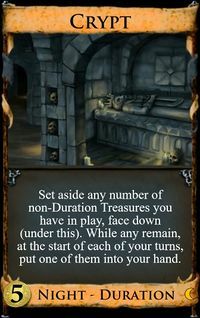 Crypt : Put one of the set aside Treasures into your hand. 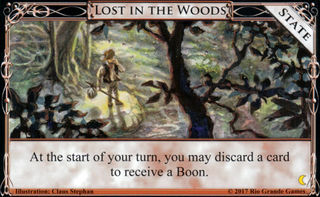 Lost in the Woods : You may discard a card to receive a Boon. 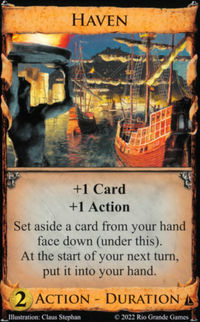 Cargo Ship : Put the set aside card into your hand. 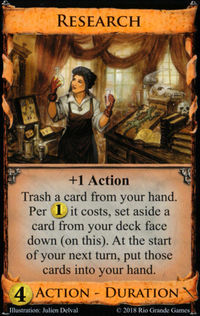 Research : Put the set aside cards into your hand. 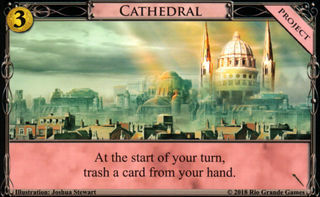 Cathedral : Trash a card from your hand. 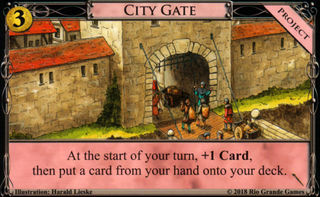 City Gate : +1 Card, then put a card from your hand onto your deck. 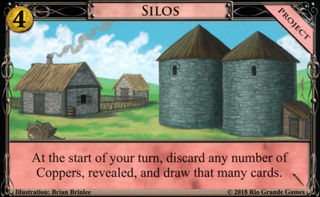 Silos : Discard any number of Coppers , revealed, and draw that many cards. 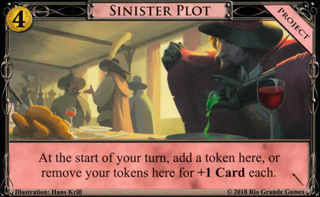 Sinister Plot : Add a token here, or remove your tokens here for +1 Card each. 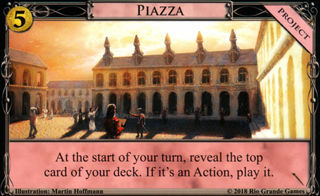 Piazza : Reveal the top card of your deck. If it's an Action, play it. 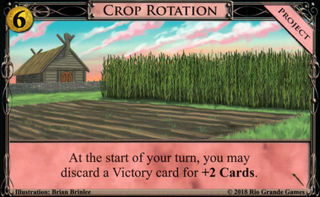 Crop Rotation : You may discard a Victory card for +2 Cards. Prince : Play the set aside Action. 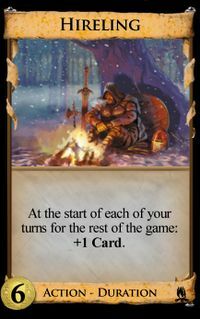 Summon : Play the set aside Action. 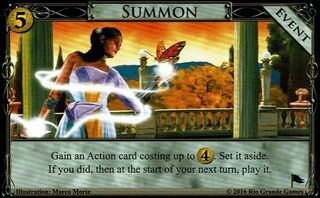 These effects take place "first"—i.e., before other effects triggered by playing a card. 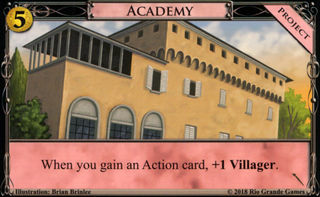 Vanilla bonus Adventures tokens (Teacher , Seaway , Lost Arts , Training , Pathfinding ): If the card's supply pile has your token on it, get the vanilla bonus. 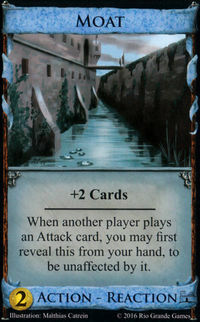 Moat : Another player may reveal this from their hand; if they do, they are not affected by the Attack. 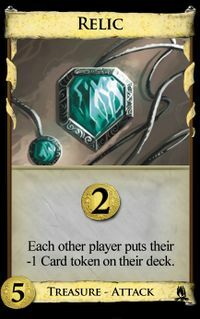 Secret Chamber : Another player may reveal this from their hand. 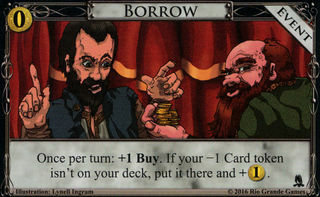 If they do, they draw 2 cards, then puts 2 cards from their hand on top of their deck. 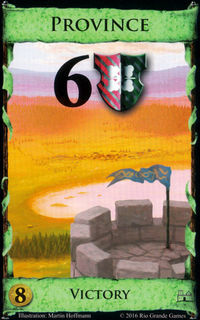 Diplomat : Another player may reveal this from their hand of 5 or more cards. If they do, they draw 2 cards, then discard 3 cards. 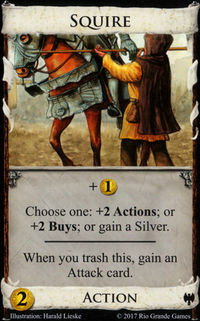 Horse Traders : Another player may set this aside from their hand. 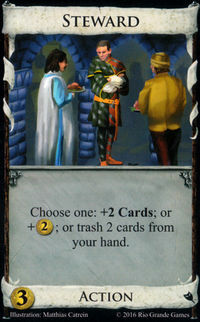 Beggar : Another player may discard this [from their hand]. 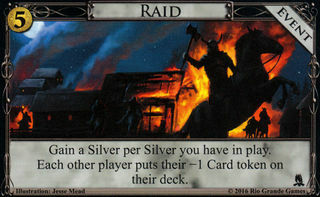 If they do, they gain two Silvers , putting one on top of their deck. 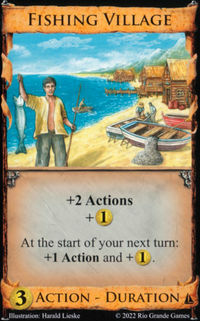 Urchin : You may trash this from play if it is not the played Attack card. 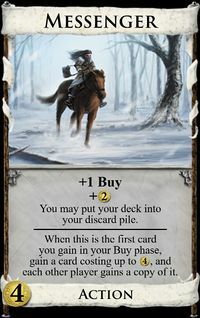 If you do, gain a Mercenary from the Mercenary pile. 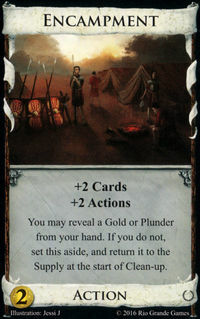 Caravan Guard : Another player may play this from their hand. 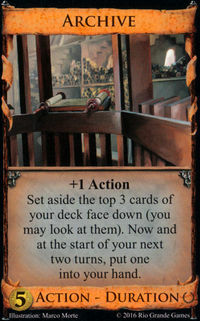 These effects take place after the card enters the play area but before you resolve any of its own on-play abilities. 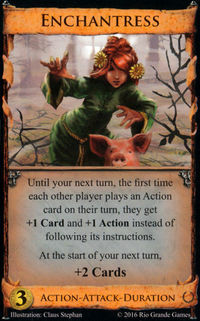 Enchantress : If it's the first time you've played an Action this turn, get +1 Card and +1 Action instead of following its instructions. 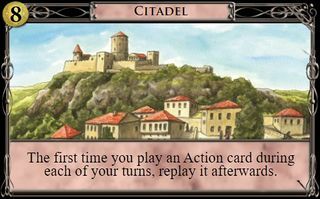 Citadel : If it's the first time you've played an Action this turn, play it again afterwards. 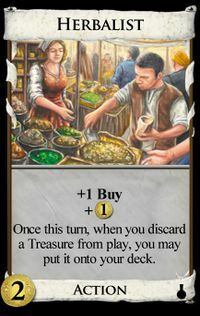 Merchant : If it's the first Silver you're played this turn, + . Sauna : You may trash a card from your hand. 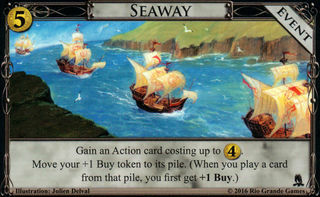 The vast majority of Action and Treasure cards have on-play effects of some kind. 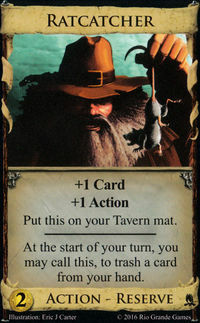 Several Treasures, plus the Action card Noble Brigand , use phrasing along the lines of "when you play this". 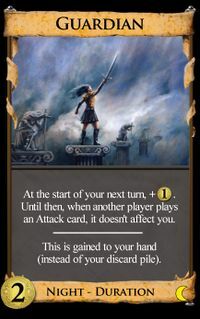 Despite the similarity of this wording to things like "when you play an Attack card", this is not the same trigger. 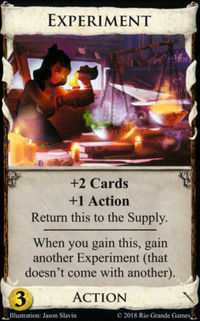 On-play effects of cards always take place after the "when you play a card" effects of other cards. 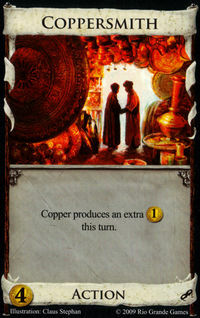 Coppersmith : Copper produces an extra this turn. 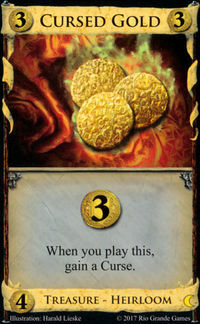 Coin of the Realm : You may call this, for +2 Actions. 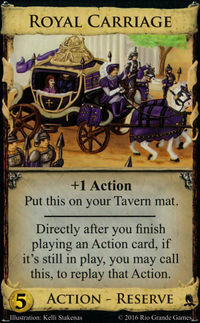 Royal Carriage : If the Action is still in play, you may call this, to replay that Action. 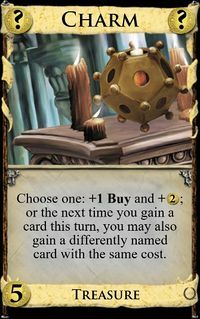 Remember that buying a card happens before gaining it, so all these effects happen before you gain the relevant card, and before any of its on-gain effects happen. 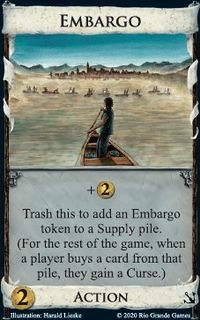 Embargo : Gain a Curse card per Embargo token on that pile. 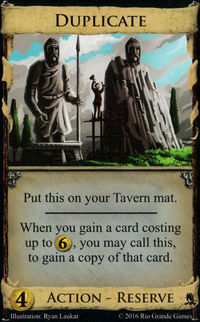 Talisman : If the card costs or less and is not a Victory card, gain a copy of it. 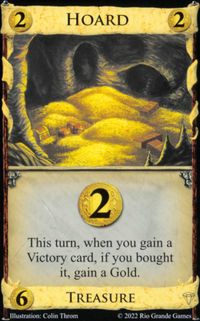 Hoard : If it is a Victory card, gain a Gold . 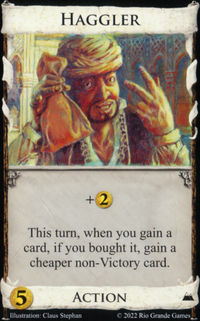 Haggler : Gain a card costing less than it that is not a Victory card. 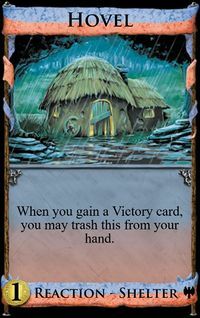 Hovel : If it is a Victory card, you may trash this from your hand. 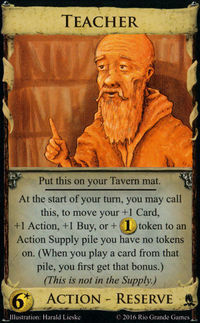 Merchant Guild : Take a Coin token. Haunted Woods : Put your hand on top of your deck in any order. 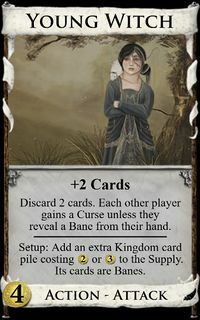 Swamp Hag : Gain a Curse . 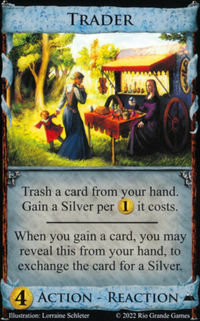 Plan : If the bought card has your Trashing token on it, you may trash a card from your hand. 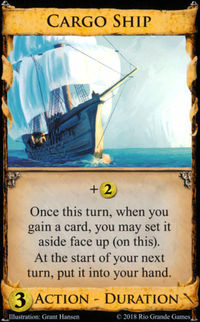 Charm : If this is the next card you've bought this turn, you may also gain a differently named card with the same cost. Tax : Take the from its pile. Basilica : If you have or more left, take 2 from here. 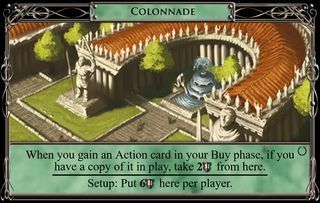 Colonnade : If it's an Action, and you have a copy of it in play, take 2 from here. Defiled Shrine : Take the from this. 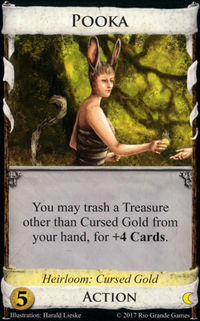 Mint : Trash all Treasures you have in play. 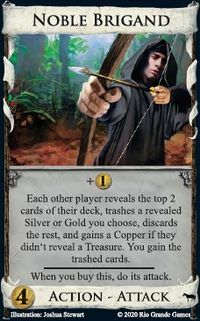 Noble Brigand : Each other player reveals the top 2 cards of his deck, trashes a revealed Silver or Gold you choose, and discards the rest. If he didn’t reveal a Treasure, he gains a Copper . You gain the trashed cards. 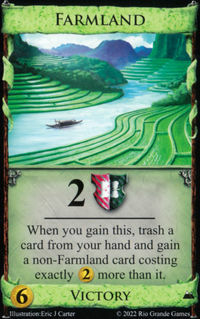 Farmland : Trash a card from your hand. 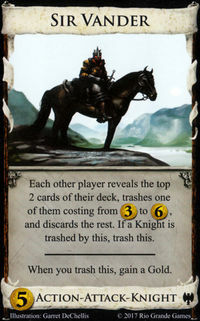 Gain a card costing exactly more than the trashed card. Stonemason : You may overpay for this. If you do, gain 2 Action cards each costing the amount you overpaid. Doctor : You may overpay for this. 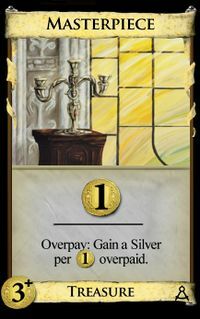 For each you overpaid, look at the top card of your deck; trash it, discard it, or put it back. Masterpiece : You may overpay for this. If you do, gain a Silver per you overpaid. Herald : You may overpay for this. 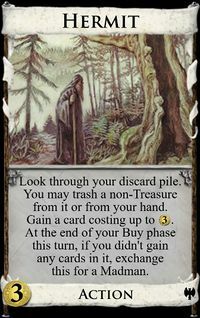 For each you overpaid, look through your discard pile and put a card from it on top of your deck. 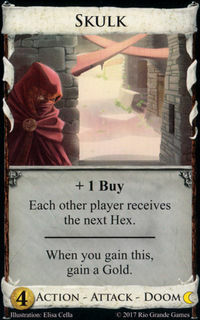 Messenger : If this is your first buy in a turn, gain a card costing up to , and each other player gains a copy of it. 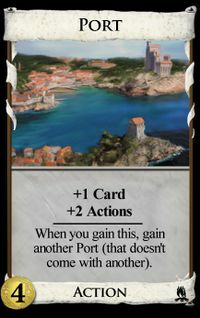 Port : Gain another Port. Events have on-buy effects by default, and are not listed separately here. Possession : The player to your right gains it instead. Trader : You may reveal this from your hand. If you do, instead, gain a Silver . 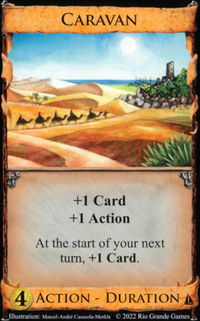 Nomad Camp : Gain this onto your deck (instead of to your discard pile). Guardian : Gain this to your hand (instead of to your discard pile). 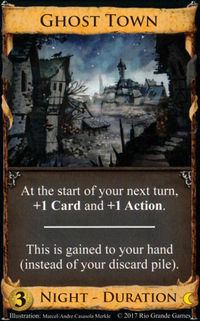 Ghost Town : Gain this to your hand (instead of to your discard pile). 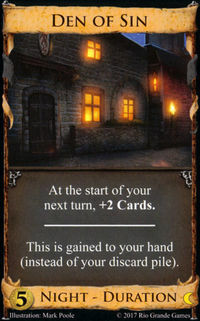 Night Watchman : Gain this to your hand (instead of to your discard pile). 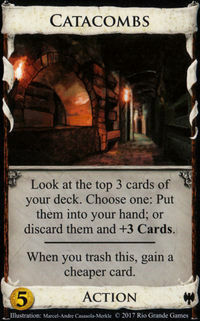 Den of Sin : Gain this to your hand (instead of to your discard pile). 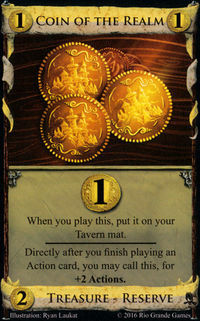 Trade Route : Move the pile's Trade Route token to the Trade Route mat. Watchtower : You may reveal this from your hand. 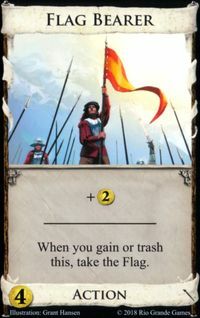 If you do, either trash that card, or put it on top of your deck. Royal Seal : You may put that card on top of your deck. 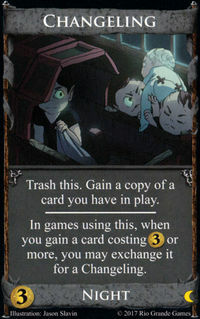 Duplicate : If the gained card costs up to , you may call this, to gain a copy of that card. 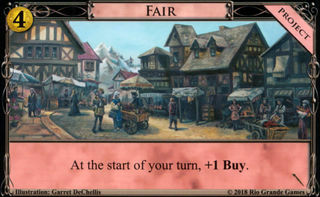 Travelling Fair : You may put that card on top of your deck. Labyrinth : If it's the 2nd card you've gained this turn, take 2 from here. 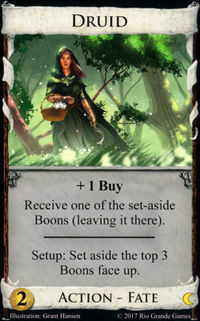 Changeling : If the gained card costs or more, you may exchange it for a Changeling. 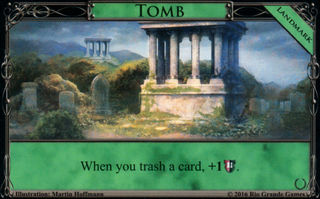 Defiled Shrine : Move 1 from its pile to this. 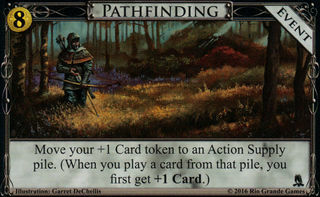 Innovation : If it's the first Action you've gained this turn, you may set it aside. If you do, play it. 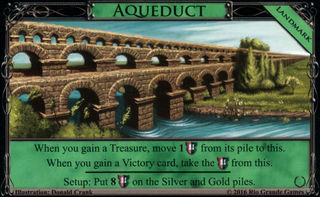 Aqueduct : Move 1 from its pile to this. Aqueduct : Take the from this. Battlefield : Take 2 from here. Cache : Gain two Coppers . Embassy : Each other player gains a Silver . 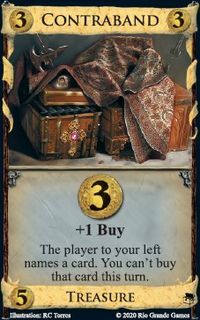 Ill-Gotten Gains : Each other player gains a Curse . 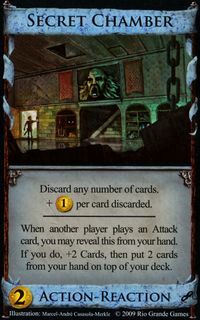 Inn : Look through your discard pile (including this), reveal any number of Action cards from it, and shuffle them into your deck. 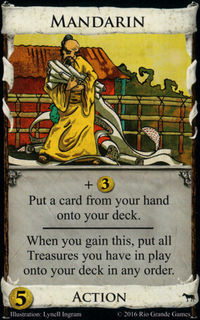 Mandarin : Put all Treasures you have in play on top of your deck in any order. 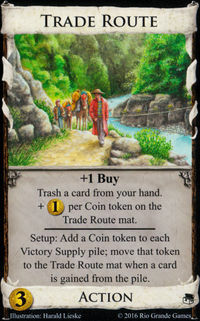 Border Village : Gain a card costing less than this. 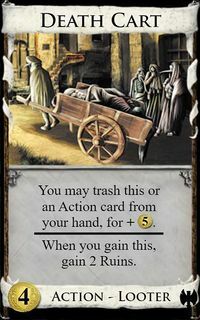 Death Cart : Gain two Ruins. 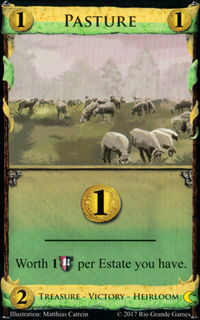 Lost City : Each other player draws a card. 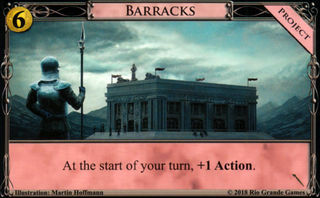 Emporium : If you have at least 5 Action cards in play, +2 . 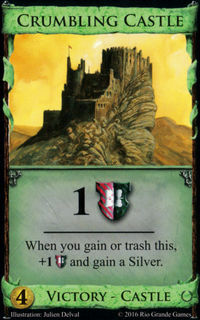 Crumbling Castle : +1 and gain a Silver . 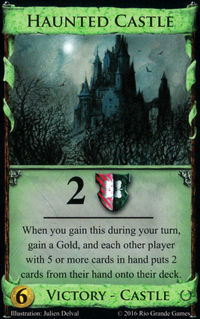 Haunted Castle : If it's during your turn, gain a Gold , and each other player with 5 or more cards in hand puts 2 cards from their hand onto their deck. 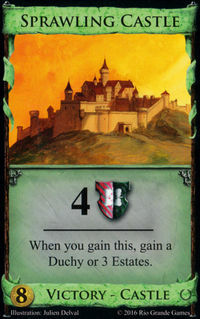 Sprawling Castle : Gain a Duchy or 3 Estates . 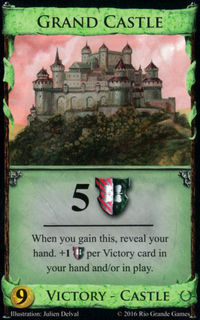 Grand Castle : Reveal your hand. 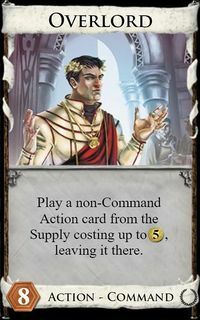 +1 per Victory card in your hand and/or in play. 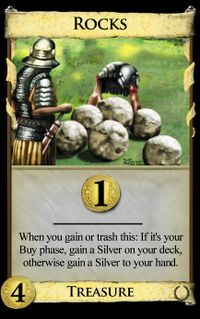 Rocks : Gain a Silver ; if it is your Buy phase, put the Silver on your deck, otherwise put it into your hand. 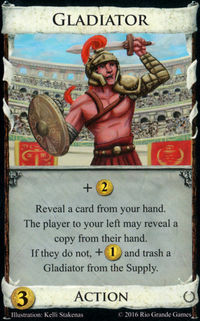 Fortune : Gain a Gold per Gladiator you have in play. 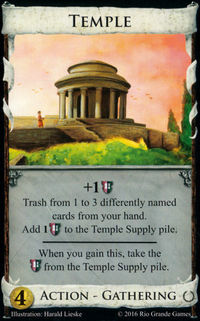 Temple : Take the from the Temple Supply pile. 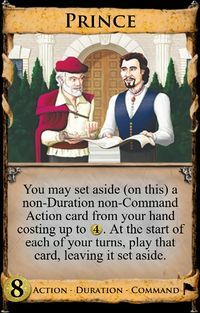 Villa : Put this into your hand, +1 Action, and if it's your Buy phase return to your Action phase. 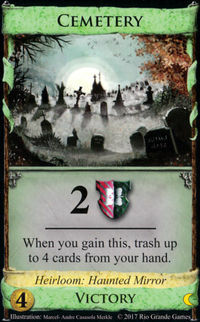 Cemetery : Trash up to 4 cards from your hand. 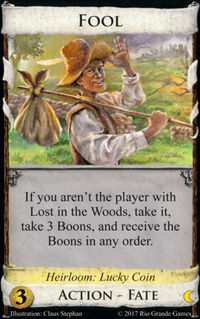 Blessed Village : Take a Boon. 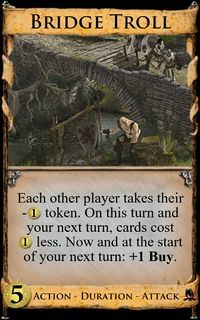 Receive it now or at the start of your next turn. Skulk : Gain a Gold . 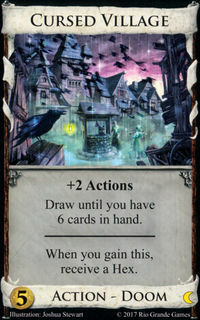 Cursed Village : Receive a Hex. 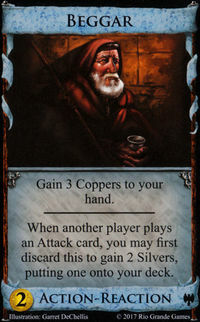 Ducat : You may trash a Copper from your hand. Experiment : Gain another Experiment (that doesn't come with another). 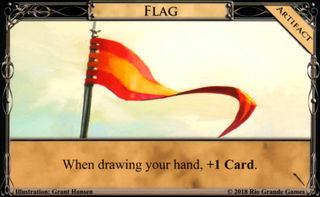 Flag Bearer : Take the Flag . Silk Merchant : +1 Coffers and +1 Villager. 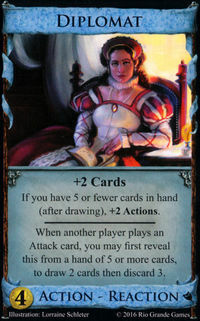 Duchess : If the gained card is a Duchy , you may gain a Duchess. 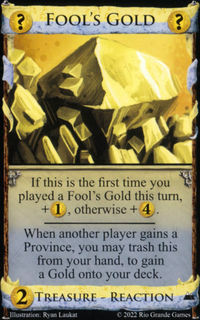 Fool's Gold : If the gained card is a Province , another player may trash this from his hand. 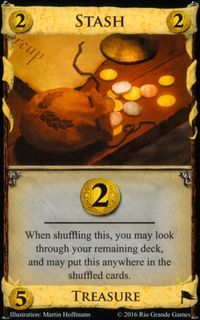 If he does, he gains a Gold, putting it on his deck. 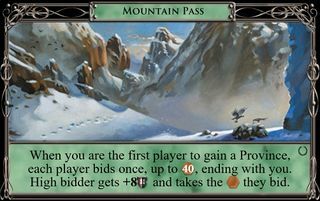 Mountain Pass : If the gained card is the first Province gained this game, after this turn, each player bids once, up to , ending with you. 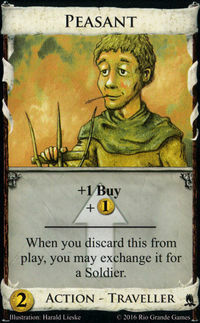 High bidder gets +8 and takes the they bid. 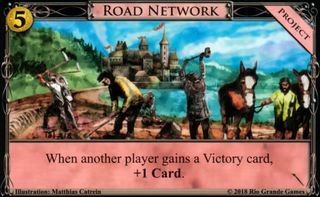 Road Network : +1 Card. 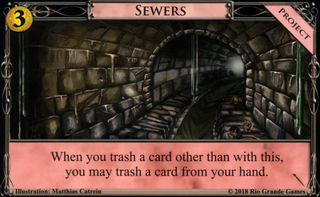 Sewers : If it wasn't with this, you may trash a card from your hand. 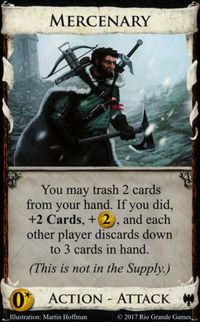 Possession : Set aside the trashed card. Market Square : You may discard this from your hand. If you do, gain a Gold . 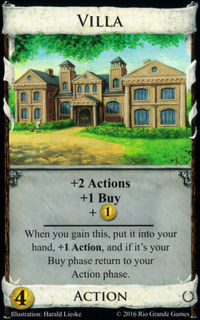 Overgrown Estate : +1 Card. Squire : Gain an Attack card. Feodum : Gain three Silvers . 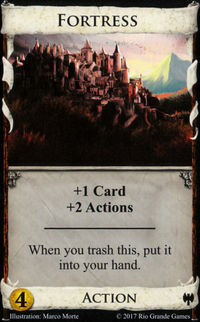 Fortress : Put it into your hand. 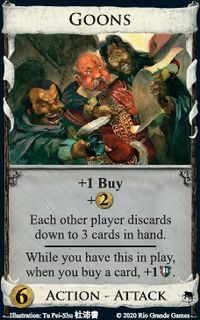 Catacombs : Gain a card costing less than this. 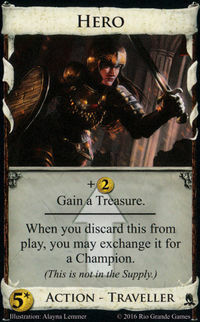 Sir Vander : Gain a Gold . 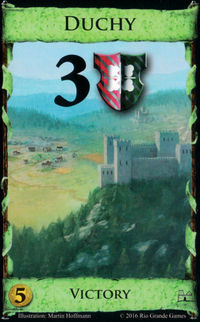 Hunting Grounds : Gain a Duchy or 3 Estates . 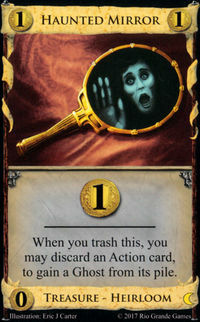 Haunted Mirror : You may discard an Action card, to gain a Ghost from its pile. Arena : You may discard an Action card. If you do, take 2 from here. 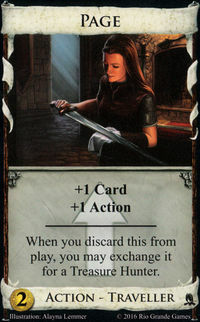 Deluded : Return this, and you can't buy Actions this turn. 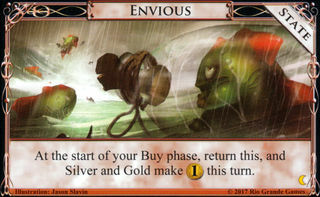 Envious : Return this, and Silver and Gold make this turn. 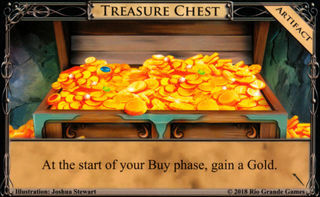 Treasure Chest : Gain a Gold. 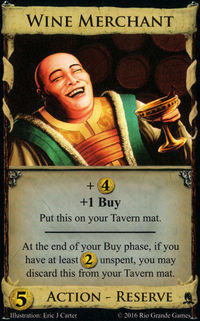 Wine Merchant : If you have at least unspent, you may discard this from your Tavern mat. 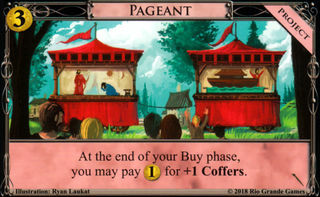 Pageant : You may pay for +1 Coffers. 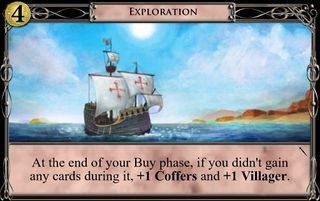 Exploration : If you didn't buy any cards, +1 Coffers and +1 Villager. Encampment : If this is set aside, return it to the Supply. 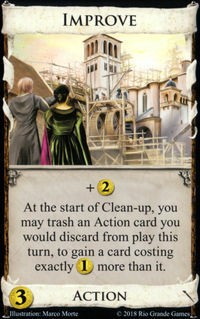 Improve : You may trash an Action card you would discard from play this turn, to gain a card costing exactly more than it. 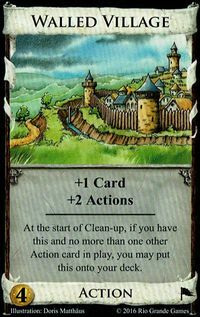 Walled Village : If you have this and no more than one other Action card in play, you may put this on top of your deck. 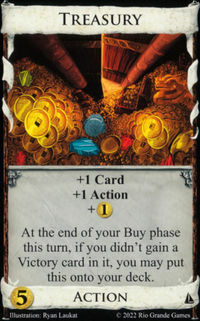 Treasury : If you didn’t buy a Victory card this turn, you may put this on top of your deck. 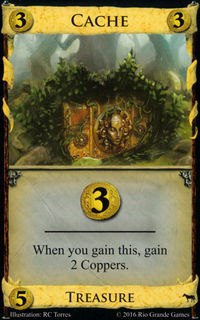 Herbalist : You may put one of your Treasures from play on top of your deck. 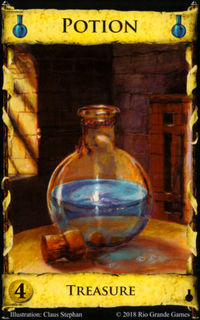 Alchemist : You may put this on top of your deck if you have a Potion in play. 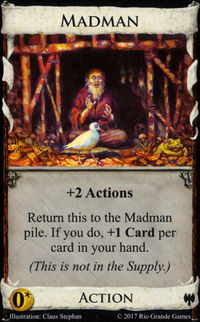 Hermit : If you didn’t buy any cards this turn, trash this and gain a Madman (from the Madman pile). 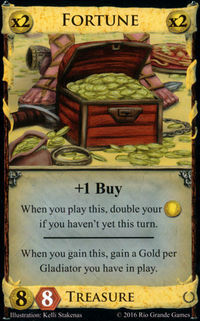 Page : You may exchange this for a Treasure Hunter . 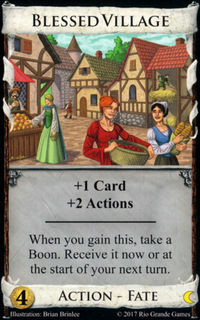 Peasant :You may exchange this for a Soldier . Soldier : You may exchange this for a Fugitive . Treasure Hunter : You may exchange this for a Warrior . Fugitive : You may exchange this for a Disciple . Warrior : You may exchange this for a Hero . 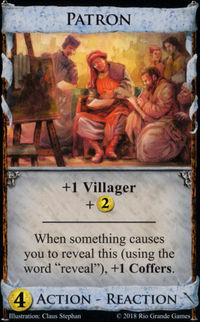 Disciple : You may exchange this for a Teacher . Hero : You may exchange this for a Champion . 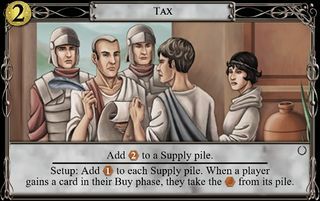 Capital : Take 6 , and then you may pay off . 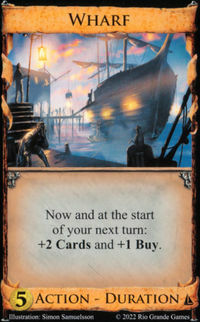 Scheme : If it is the chosen card, put it on your deck. Prince : If it was played by Prince this turn, set it aside again. 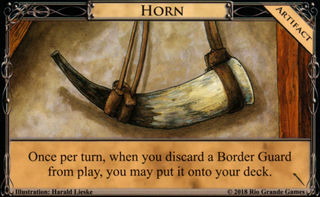 Horn : Once per turn, if it's a Border Guard , you may put it onto your deck. 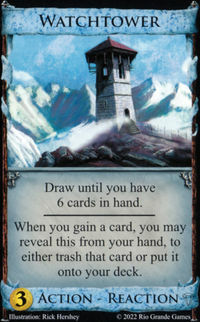 Outpost : Only draw 3 cards (instead of 5). 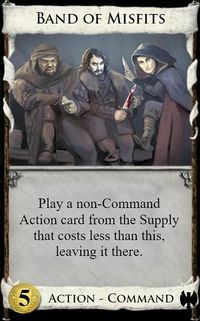 These must take place after Outpost 's effect, as they draw cards in addition to the 3 Outpost tells you to draw. 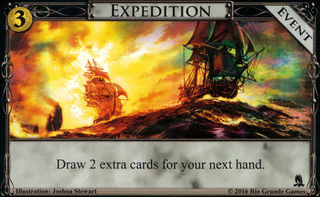 Expedition : Draw 2 extra cards. 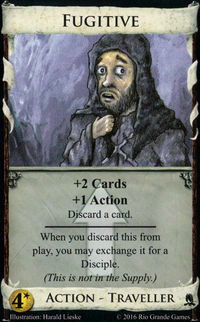 Possession : Return the set-aside cards to your discard pile. 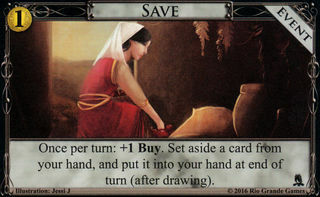 Save : Put the set-aside card into your hand. 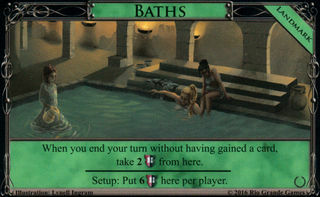 Baths : If you haven't gained any cards this turn, take 2 from here. 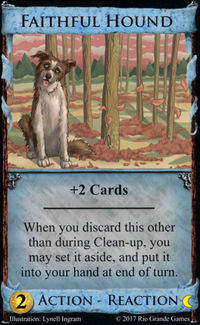 Faithful Hound : Put this into your hand. 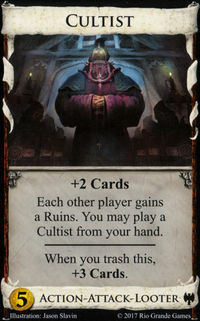 Necromancer : Turn the face down cards in the trash face up again. 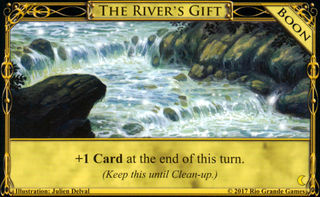 The River's Gift : +1 Card. 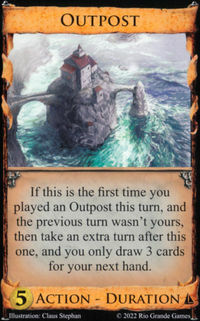 Outpost : Take an extra turn. 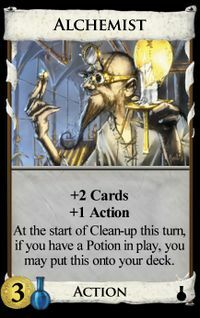 Possession : The player to your left takes an extra turn, during which you can see all cards he can and make all decisions for him, any cards he would gain you gain instead, and any cards of his that are trashed are set aside. 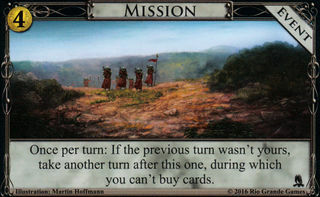 Mission : Take another turn in which you can't buy cards. 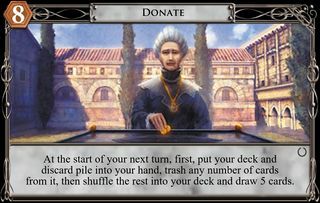 Donate : Put all cards from your deck and discard pile into your hand, trash any number, shuffle your hand into your deck, then draw 5 cards. 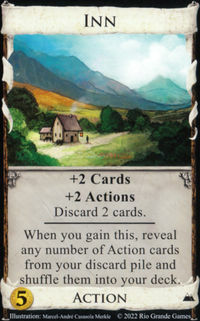 Mountain Pass : If you gained the first Province this turn, each player bids once, up to , ending with you. 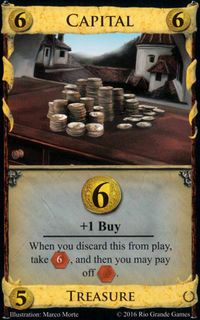 High bidder gets +8 and takes the they bid. Possession : The player to your right makes the decision for you. Tunnel : You may reveal this. If you do, gain a Gold . 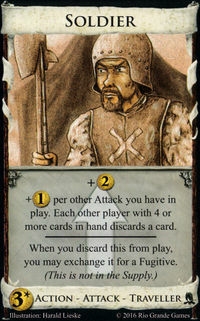 Faithful Hound : You may set this aside, and put it into your hand at end of turn. 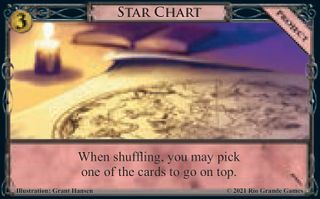 Star Chart : You may pick one of the cards to go on top. 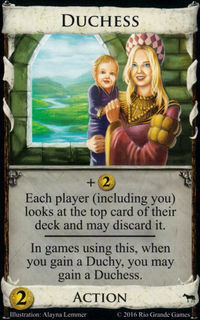 Stash : You may look through your remaining deck, and may put this anywhere in the shuffled cards. 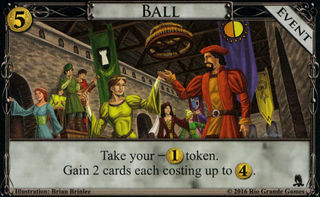 – token (Bridge Troll , Ball ): Earn less and lose the token. 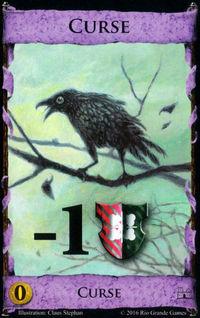 –1 Card token (Relic , Borrow , Raid ): Lose the token instead. A number of Landmarks have effects at this time, and are not listed separately here. 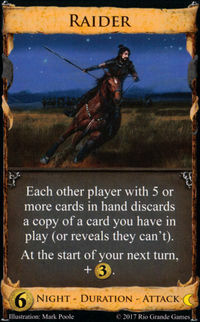 The cards listed below have effects that persist over some extended period of time, rather than being resolved at a specific, unique point in time. Many of them have the effect of setting up a trigger for a punctual event as listed above, which can be triggered any number of times as long as whatever factor conditions the persistent effect remains active. 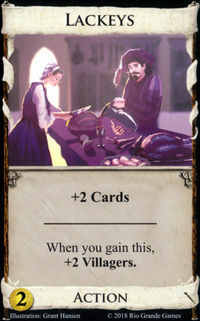 Others cause more general changes to gameplay while they obtain, such as changing the costs or other characteristics of cards. 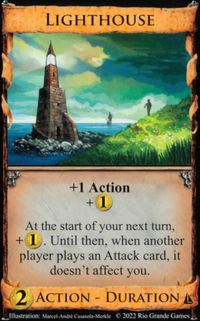 Lighthouse : When another player plays an Attack card, it doesn’t affect you. 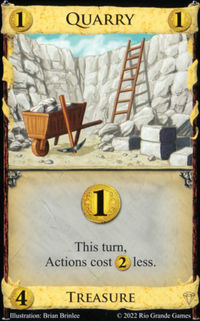 Quarry : Action cards cost less, but not less than . 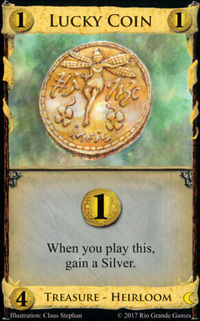 Talisman : When you buy a card costing or less that is not a Victory card, gain a copy of it. 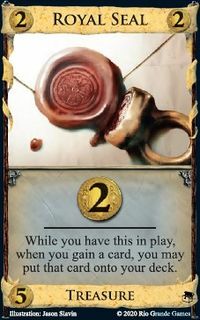 Royal Seal : When you gain a card, you may put that card on top of your deck. 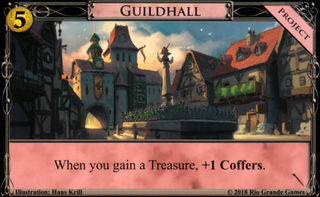 Goons : When you buy a card, +1 . 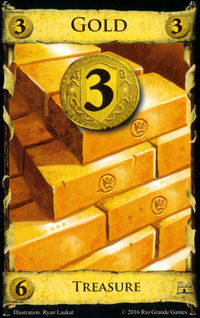 Hoard : When you buy a Victory card, gain a Gold . 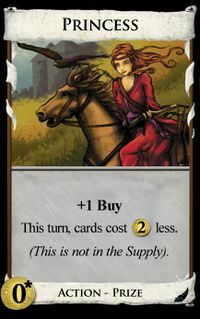 Princess : Cards cost less, but not less than . 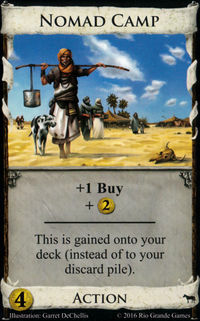 Haggler : When you buy a card, gain a card costing less than it that is not a Victory card. 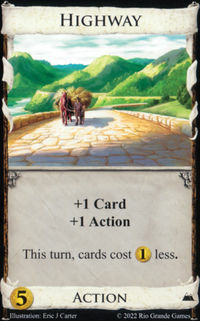 Highway : Cards cost less, but not less than . 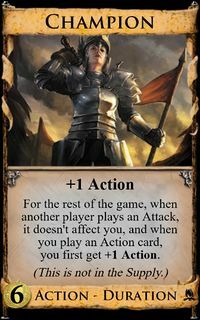 Band of Misfits : This is the chosen Action card. 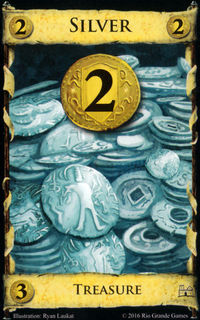 Merchant Guild : When you buy a card, take a Coin token. 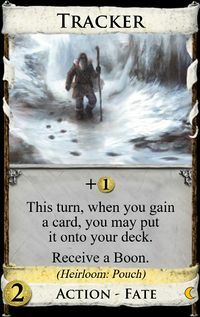 Bridge Troll : If it is your turn, cards cost less, but not less than . 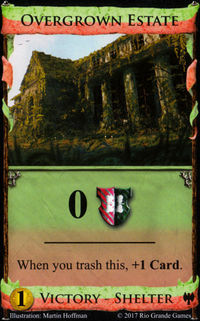 Overlord : This is the chosen Action card. 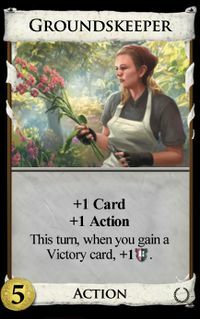 Groundskeeper : When you gain a Victory card, +1 . 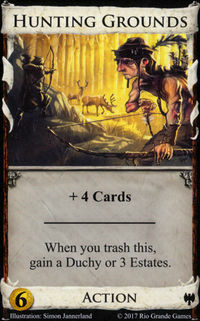 Tracker : When you gain a card, you may put that card onto your deck. 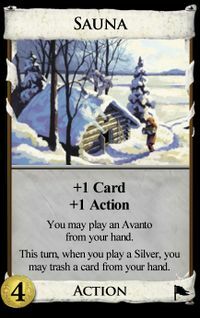 Sauna : When you play a Silver , you may trash a card from your hand. 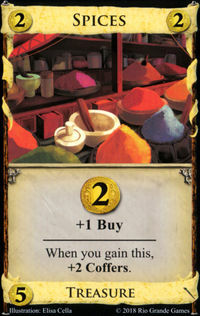 Grand Market : While you have Copper in play, you can't buy this. 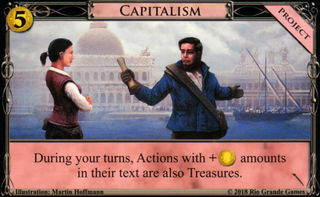 Capitalism : Actions with + amounts in their text are also Treasures. 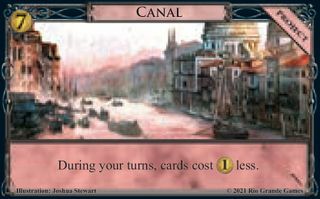 Canal : Cards cost less, but not less than . 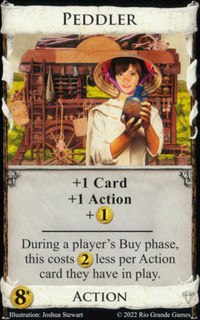 Peddler : This costs less per Action card you have in play, but not less than . 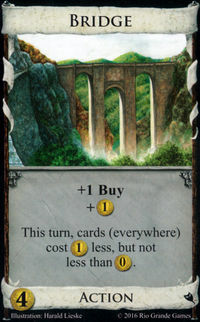 Bridge : All cards cost less, but not less than . Coppersmith : Copper produces an extra . 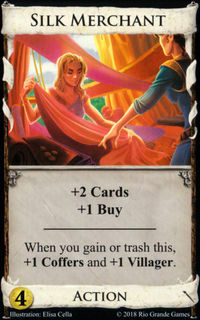 Contraband : You can't buy the named card. 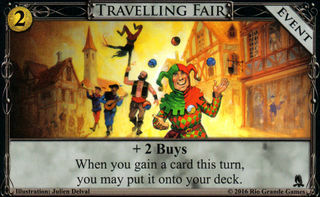 Travelling Fair : When you gain a card, you may put it on top of your deck. 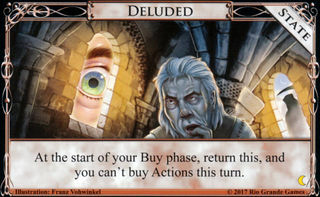 Deluded : You can't buy Actions this turn. 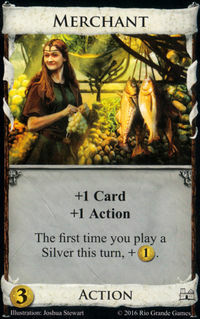 Envious : Silver and Gold make this turn. 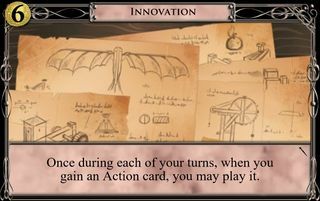 Inventor : All cards cost less (but not less than ). 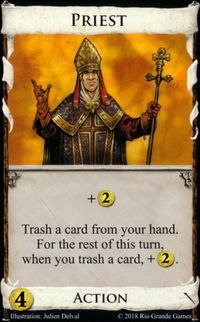 Priest : When you trash a card, + . 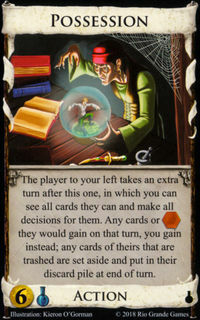 Possession : The player to your right can see all cards you can and makes all decisions for you. Any cards you would gain, he gains instead; any cards of yours that are trashed are set aside. Mission : You can't buy cards. 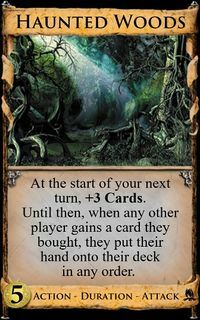 Haunted Woods : When any other player buys a card, he puts his hand on top of his deck in any order. 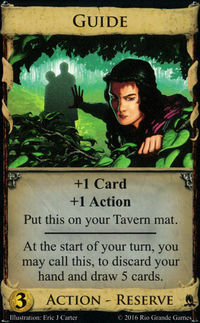 Swamp Hag : When any other player buys a card, he gains a Curse . 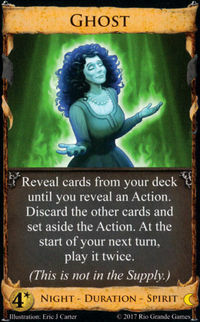 Enchantress : The first time each other player plays an Action card on their turn, they get +1 Card and +1 Action instead of following its instructions. Guardian : When another player plays an Attack card, it doesn't affect you. 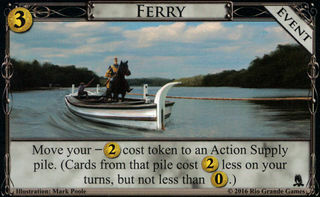 Ferry : If it is your turn, cards from the pile cost less, but not less than . 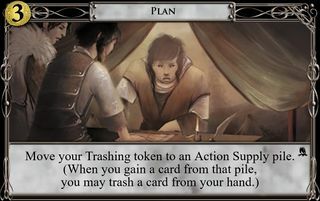 Plan : When you buy a card from the pile, you may trash a card from your hand. 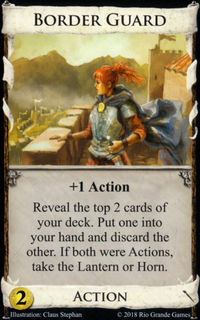 Vanilla bonus Adventures tokens (Teacher , Seaway , Lost Arts , Training , Pathfinding ): When you play a card from the pile, first get the vanilla bonus. 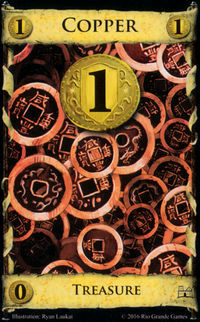 Embargo : When anyone buys a card from the pile the Embargo token was put on, they gain a Curse card. This in principle could also be considered a "while a token is on a Supply pile" effect; but, unlike the tokens listed above, it's not possible to move an Embargo token off a Supply pile once placed. 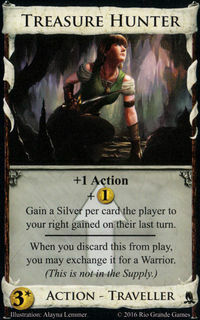 Hireling : At the start of each of your turns, +1 Card. Champion : When another player plays an Attack, it doesn't affect you, and when you play an Action, +1 Action. 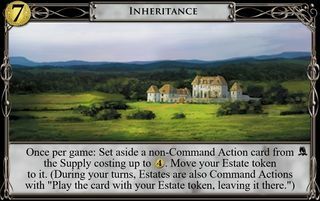 Inheritance : Your Estates also have the types and abilities of the set-aside card. This has the same caveat as Embargo above. 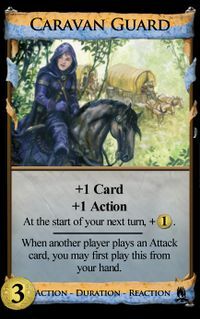 Prince : At the start of each of your turns, play the set-aside Action if it has successfully been set aside each turn since you played Prince. 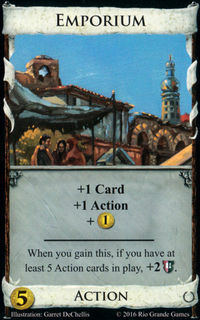 Several Landmarks have persistent effects that last for the entire game. They are not listed separately here. This page was last modified on 7 November 2018, at 13:54. This page has been accessed 15,644 times.